The responsibilities of Revenue Cycle Management can become overwhelming for a healthcare provider. Revenue cycle management involves compliance in ensuring accurate coding, careful and timely billing processes and following up on Accounts Receivables. That means healthcare providers require trained staff, updated technology and centralized billing. It has been observed that when healthcare facilities outsource or partner with a reliable billing company, they can operate more efficiently and effectively offer medical services. The first most important thing for any healthcare facility is to improve front-end operations, so that vital information can be recorded accurately. Secondly, insurance eligibility should be checked to avoid any future problems and to get the necessary billing data accurately. Staff training needs to be done on a continual basis to keep up with the changing regulations in the healthcare industry. This will ensure that front end operations are more efficient and claim rejections or denials are reduced. High quality patient care along with reduced operational costs can be a challenge for any healthcare facility. It is vital that they receive timely and correct payments from patients and insurance companies. This is why the revenue cycle should be managed effectively from the time a patient’s case is opened until the receipt of final payment. 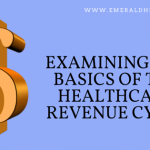 Professional medical billing companies that offer revenue cycle management, such as Emerald Health, can help you manage the revenue cycle of your practice or healthcare facility efficiently and effectively. To learn more about the services offered by medical billing companies in Massachusetts, call Emerald Health LLC at 855-650-9906 Today.